Many reasons can explain why you would want to relocate a piece of art – whether it is because you recently bought it or because you’re moving, the important thing to note is that art relocation requires detailed skills as it can easily be damaged when it is incorrectly packaged. 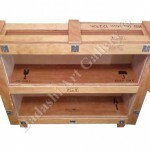 With our many years of experience, we provide packaging and crating services for the transport of high value and fragile pieces and can arrange shipping worldwide. We make sure to understand the nature of the artwork and package and crate accordingly. This ensures that we provide a safe and cost effective custom packaging solution with the appropriate internal protection. 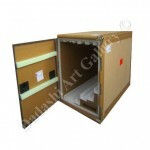 Our goal is to give you the certainty that your artwork will arrive safely at its destination. Art collectors living outside of Canada should be aware that artwork purchased created by a living Canadian artist is exempt from sales tax when shipped outside of Canada. Below are a few examples of typical crates and packages for artwork, for further information please get in touch via our contact page.